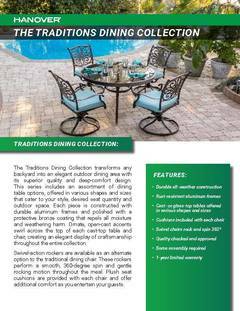 The Traditions 5-Piece Swivel Dining Set beautifully transforms any backyard into an elegant outdoor dining area with its superior quality and deep comfort feel. Included in this set are four deep cushioned swivel chairs and a 48-inch round dining table. Both the chairs and table have alumnicast frames featuring heavy gauge and rust resistant aluminum-alloy extrusions with uniquely supported inner walls. Each chair performs a smooth, 360-degree spin and gentle rocking motion without affecting their stance. The cushions are built to last with a high grade of 100 percent polyester wrapped around polyurethane foam, ensuring deep comfort while maintaining its original full shape. The fabric is also specifically designed, woven and treated for quick drying while resisting stains and UV harm. 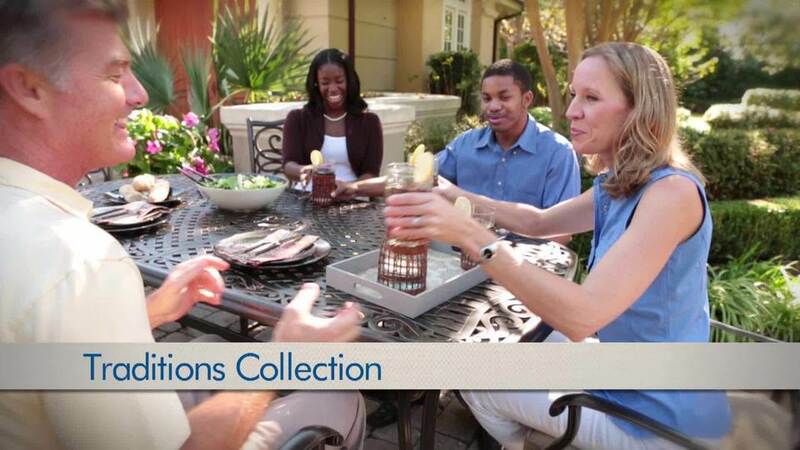 Designed to last, this five-piece outdoor dining set will surely provide you with a natural alternative to entertaining indoors. Minor assembly is required.